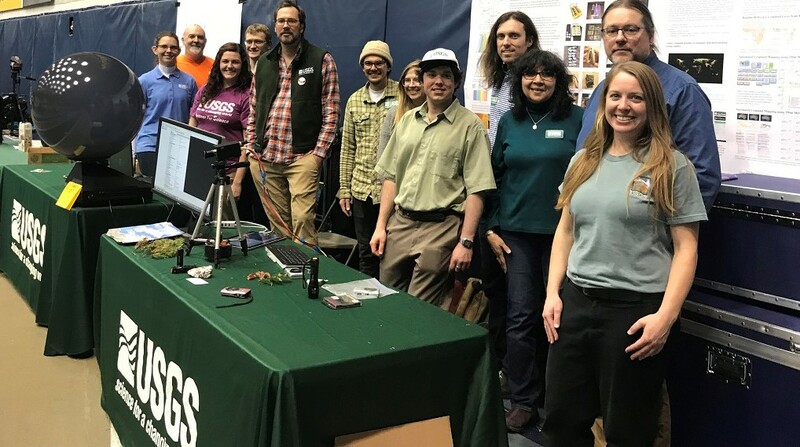 Members of the Astrogeology Science Center (ASC) stepped out last Monday night to join with other USGS Flagstaff Field Center employees and the greater Flagstaff Community in a fun-filled celebration of all things STEM (Science, Technology, Engineering, and Math). The 6th annual Flagstaff Community STEM celebration was held at the Northern Arizona University Skydome. Over 2000 people braved the rainy weather to join in the fun and learn about STEM! ASC was happy to show off the “Magic Planet” - a spherical projection system that can be used to help science enthusiasts of all ages to visualize many of the global planetary data sets produced at the ASC and elsewhere. The young, and the young-at-heart were thrilled to watch the Magic Planet change from Earth, to Mercury, to Mars, and beyond. 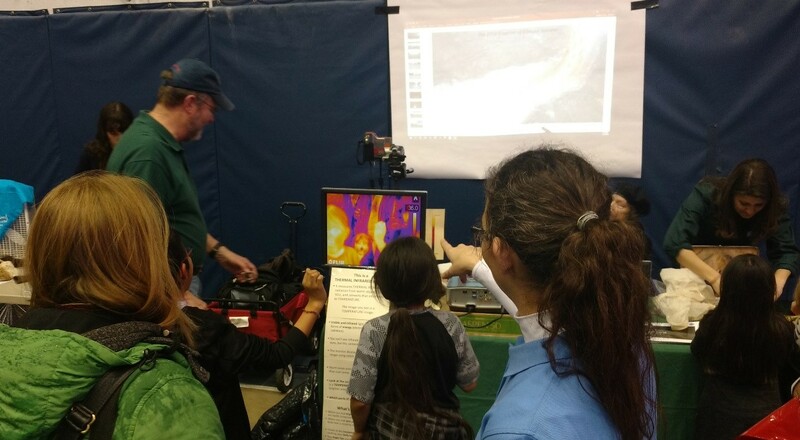 Attendees also enjoyed having the opportunity to “see” themselves through the eye of an infrared camera – learning about how the camera’s detector senses the infrared energy emitted by theirs hands and faces! Participants intrigued by the Infrared Camera activity. Astrogeology employees, along with employees from other USGS Science Centers including Geology, Arizona Water, Southwest Biology, and Western Geography, pleased the crowds with lots of handouts including maps, images, fact sheets, and various kinds of career information. The ASC was among the last STEM Night participants to break down their displays for the evening – having interested community members linger until the very end. The following day, ASC employees began preparations for the upcoming ASC Open House, scheduled for September 29, 2019. On that day, the community will be invited to visit the Astrogeology Science Center for even more STEM and Space-related activities and education! It promises to be a good time for all! 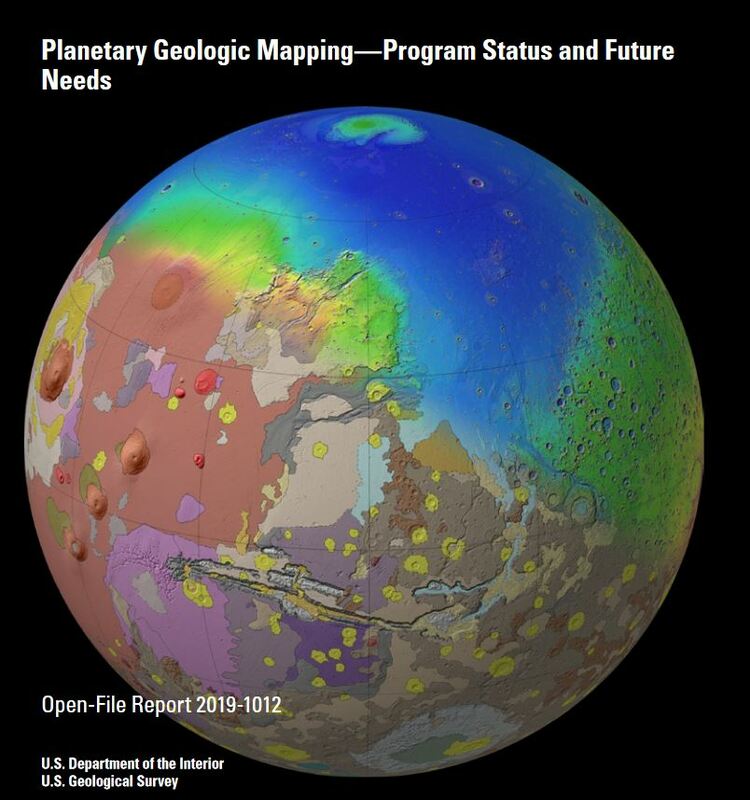 The piece below was written by Alicia Vaughan, a former USGS Astrogeology researcher who played many roles* on the Mars Exploration Rover mission. The night Opportunity landed was the MOST exciting night of my life. My children are always offended by that, but it’s true. Lots of people have kids, but few people have the chance to be “in the room where it happened,” at JPL, landing a robot on another planet. Seeing those first images come down was thrilling. They revealed sedimentary layers – bedrock on Mars! Opportunity had rolled into a small crater - what we later called the interplanetary hole-in-one. I got to experience the unabashed joy of scientists and engineers who had spent the better part of a decade of their careers designing, building, testing, and programming to get Opportunity successfully to Meridiani Planum, Mars. And there I was, a recent graduate having an almost out-of-body experience. Is this really happening to me? Do I really get to work with these brilliant people, on this mission? I did, for nearly 8 years. I started out monitoring the downlink data for one instrument – making sure the instrument was performing correctly, processing the data, helping with interpretation and making plans for the next observations. I lived on Mars time – using blackout curtains to try and block out Earth’s daylight cycles. Since a Martian day is slightly longer than an Earth day, I had to report for my shift a little bit later each day, just marching around the clock starting at 2:00 am one day 7:00 am a few days later. Once, I actually pulled up to Starbucks at 1:00 in the morning and was so disappointed when they weren’t open. My dog really struggled with Mars time. He did not understand why I was making him go outside in the middle of the night in the pouring rain to potty, and then I would come home and sleep all day while he barked at the world outside. I went on to do many different jobs on the rovers – both Spirit and Opportunity. I wrote commands for different instruments, building part of the “upload” package each day. I made mistakes. Once I made a conversion error that pointed an instrument in a dangerous direction. I had to work back through my mistakes to determine exactly what I had commanded and explain to a senior engineer what I had done, and then I worried for weeks that they might ask me to step down, or that I would never be taken seriously again. But I kept working, and they let me continue to grow. want to be like that when I grow up.” But I was growing up. I got married and had my first child during my time on this mission. I could call myself a leader on the MER team. I loved sharing Mars with students. During my time on the mission, I took every opportunity to work with students – everything from summer camps to science fairs to classroom talks in both Pasadena and Flagstaff. I loved it so much, I thought that maybe I should move on and be a teacher. So I did. I love working with students and I have never looked back. I helped take Opportunity all the way to Endeavour Crater before I moved on. 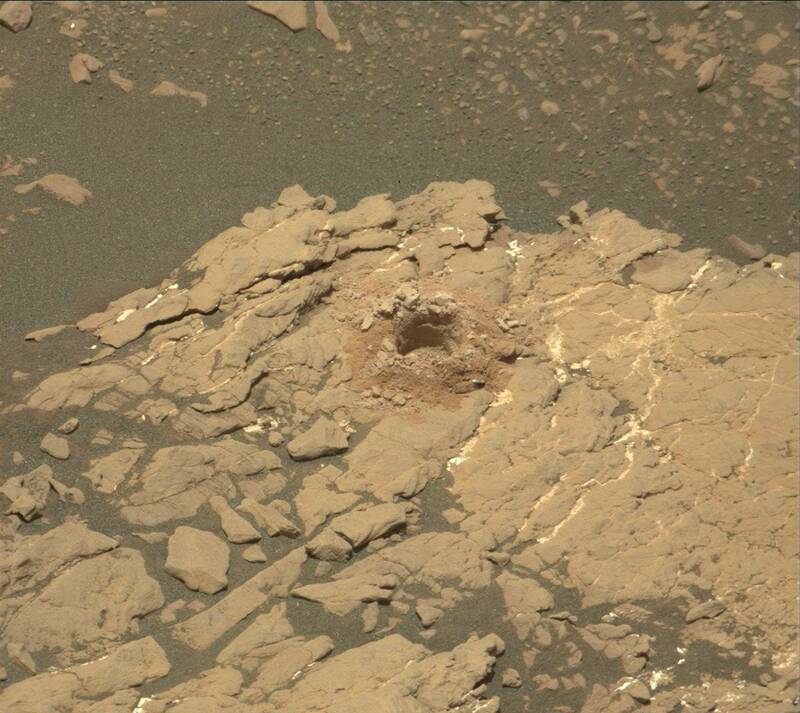 I worked thousands of sols on Mars. It was a highlight of my life. She made us all so proud, and she felt like family. It was truly special. A job well done indeed. 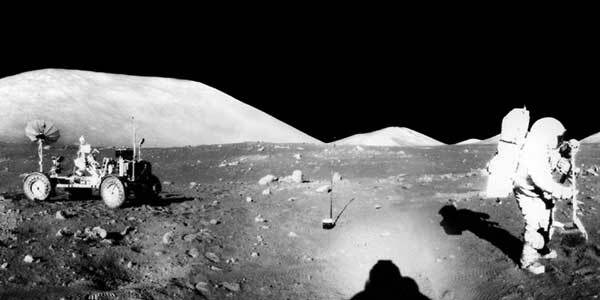 Dr. Ivo Lucchitta, and Dr. Baerbel Lucchitta Scientist Emeritus at Astrogeology Science Center, will be giving a talk entitled From the Mountain to the Moon on Wednesday February 13th about their personal experiences as USGS scientists helping with the Apollo missions, from training the astronauts to mapping the landing sites. Even if you think you know all there is to know about Apollo, you're bound to learn something new from these two! The lecture will begin at 6:00 pm, at Coconino Community College, Lone Tree Campus (in the main atrium).